Mark your calendar: the Cascading Rivers Scenic Bikeway Ride takes place September 29-30, 2018. 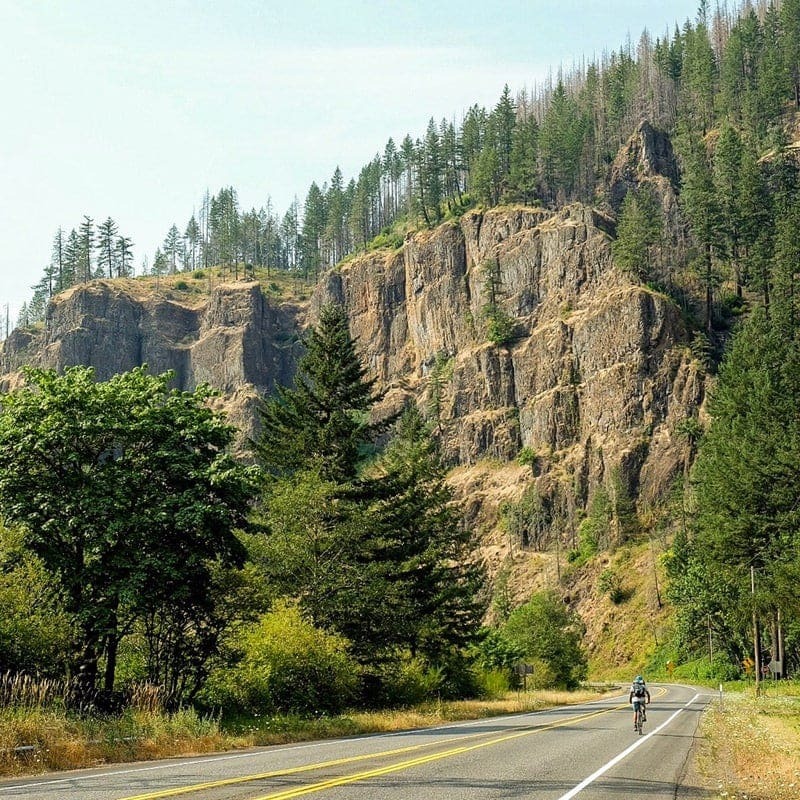 Choose from four adventure-packed routes for every skill level: Timothy Lake Gravel Ride, Killer Fang, Raging Rapids and Little Riffles. More details are available here. A couple’s weekend getaway can mean a lot of things for different people. 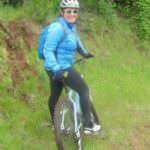 For my wife Brianna and I, the idea of a challenging, soul-satisfying bike ride ranked high on the list. 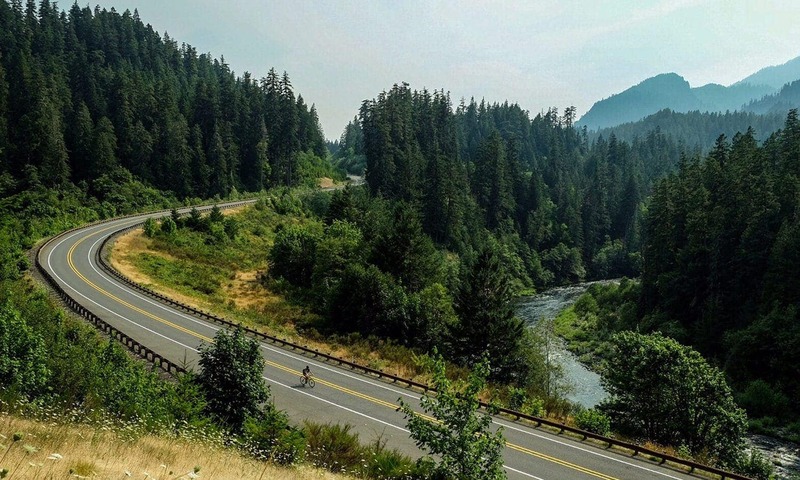 We love Oregon and the Cascading Rivers Scenic Bikeway — 70 miles of road riding alongside sparkling rivers and thick forests — seemed to fall in our laps. Really, it doesn’t get much more romantic than that. 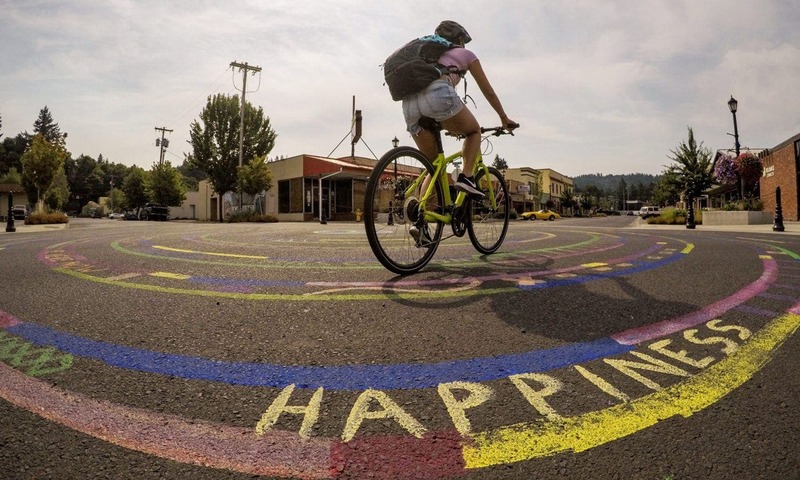 Visions of the bikeway were planted firmly in our minds. With smoky skies around our home in British Columbia, there was no better time to get away to the fresh air of Oregon. 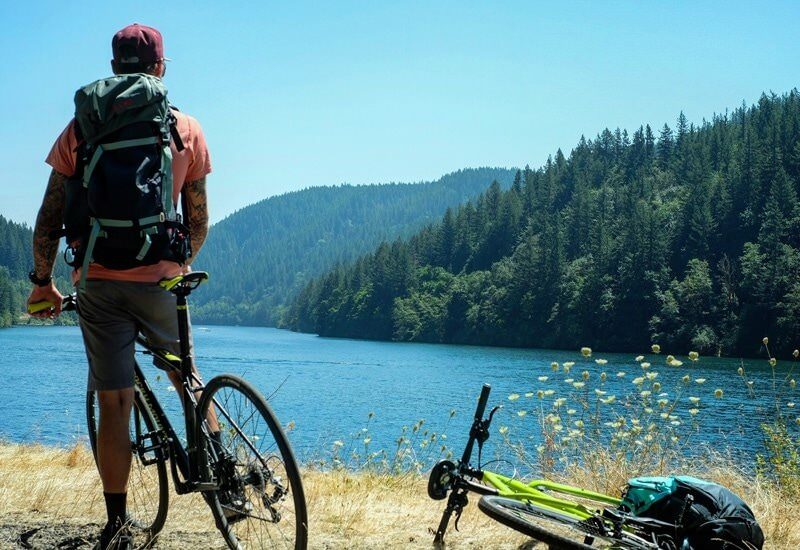 We loaded up our bikes, camping gear and sense of adventure to set out on a sure-to-be-amazing mid-summer cycling journey. Crossing the border was a breeze. We cruised south on Interstate-5 into Portland, then some 30 miles southeast to the town of Estacada. By the time we arrived, it was late at night and not another soul was out. The charming downtown storefronts beckoned for us to return during the day. Luckily we found a campground in the Mt. Hood National Forest to rest for the evening, or at least what was left of it. We awoke with the sun at around 6:45 a.m. and rolled into Estacada. Daylight brought a fresh coat of color to the city, where we could easily spend an entire day milling through art galleries, quirky gift shops, antique malls and outdoor stores and helping ourselves to more than one taster tray at Fearless Brewing. 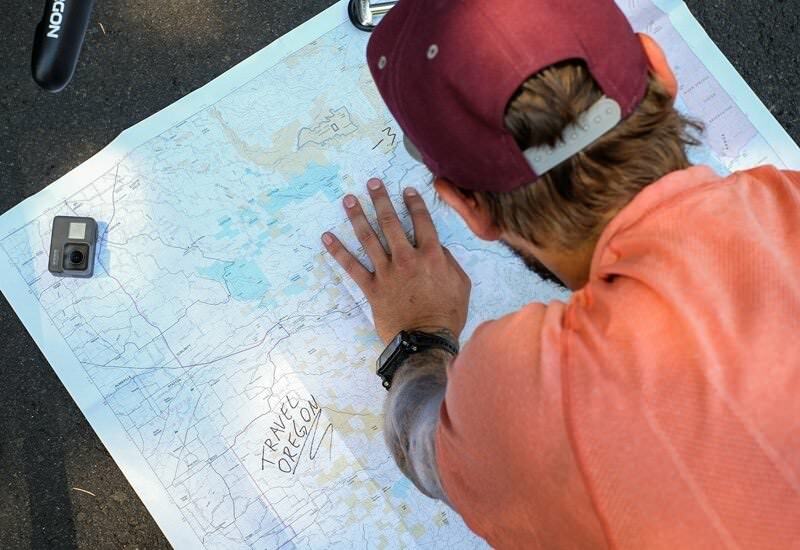 Instead we quickly slurped down some tasty hot breakfast and coffee at The Ground Coffee House and made mental notes of all the places in Estacada we needed to revisit with a deeper dive. We noticed that much of the town’s morning population consisted of anglers and other outdoors adventurers — meaning we were in good company. As we routed our trip, it became clear that we had quite an ambitious mission ahead of us. But nonetheless we were psyched! There’s nothing like rolling into the unknown. 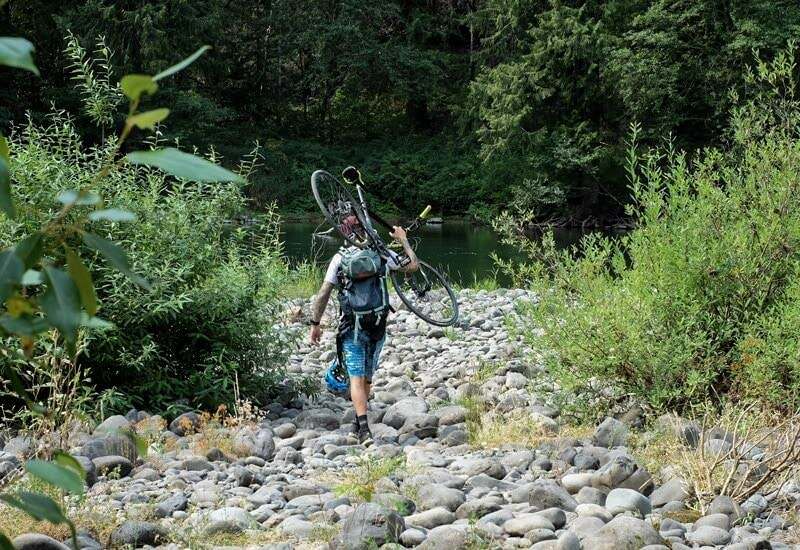 With strategically packed camping gear, food supplies and as much water as we could fit, we hit the road pedaling. 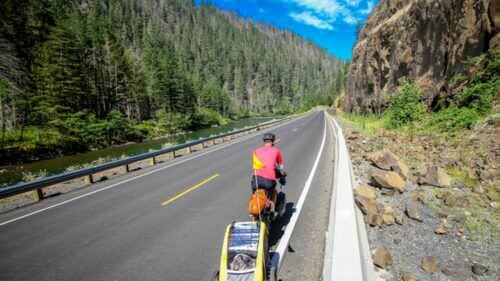 While some cyclists may start the bikeway near Detroit Lake and make their way north to the Mt. Hood and Columbia River Gorge region, we opted for the reverse, north to south. 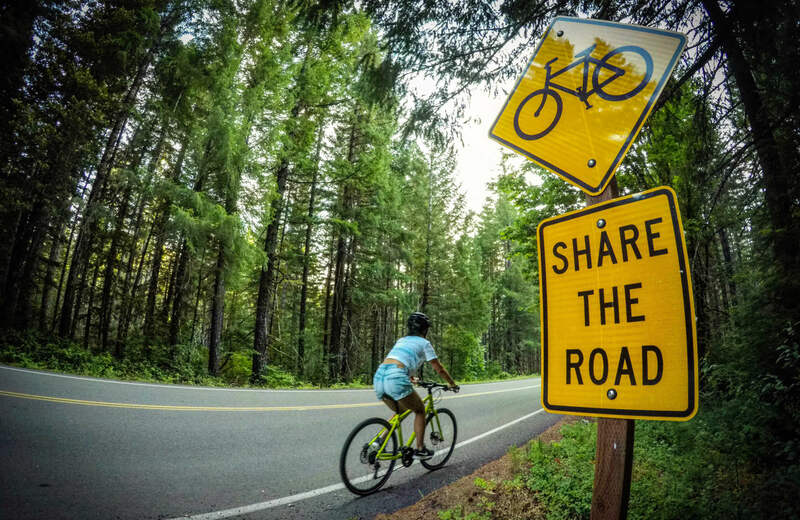 The first eight miles were peaceful on Faraday Road, which is closed to motorized vehicles and parallels the Clackamas River. The route weaves past two dams before reaching Promontory Park on the beautiful North Fork Reservoir, a family-friendly site with fishing, boat launches and rentable “yomes” — a mix between a yurt and a dome. Though the climbs were not difficult, they were long with plenty of hot summer sunshine. We made a deal to stop at every second or third campground for a breather and to dip our feet in the river. It was refreshing and we met many great people who were camping for the weekend. Barbecues were firing, and we even indulged in some hamburgers offered our way. Most were baffled by the idea of us biking that entire route, but hopefully we inspired a few others too. A dip in the crystal-clear Clackamas at Big Eddy felt more than necessary. 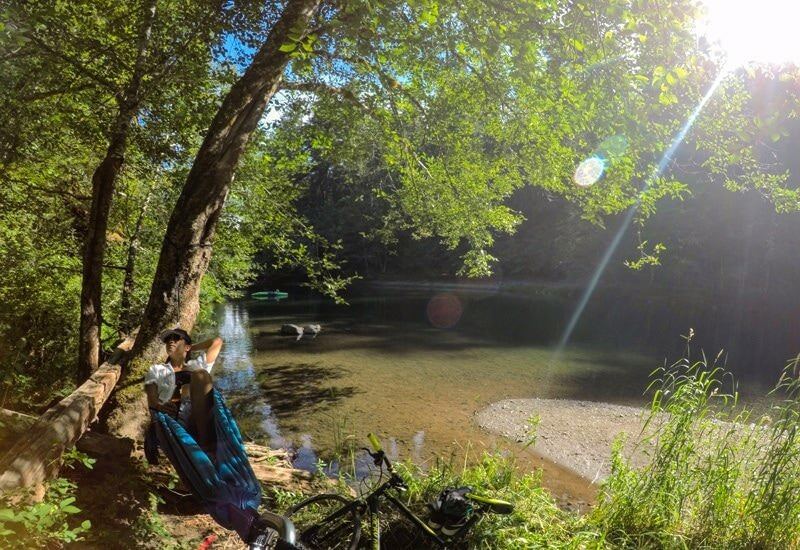 Many campgrounds — like Lazy Bend, Lockaby and Roaring River — are located along the designated Wild and Scenic sections of the Clackamas River. We even set up a tent for shade and rested at Rainbow Campground. However, my favorite was Indian Henry Campground, which is quieter and a little further removed from the bikeway. It was there, sitting above the pristine river, we could really soak in the moment and relax. Another worthy detour was the Oak Grove Fork of the Clackamas River, where a cluster of hidden waterfalls nestle into the hills. 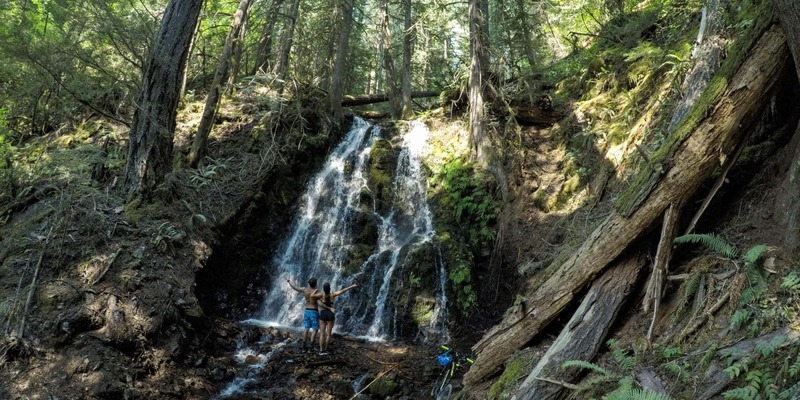 At 25 feet, Lynn Falls is impressive enough to justify a deviation from the course, and it doesn’t have the crowds you might expect at other waterfalls. Pushing on for the final downhill stretch, we more than appreciated some assistance from good ol’ gravity. We coasted down the winding forest road and into Detroit just as sunset fell. It was time for a burger and a beer — not just any burger and beer, but rather an extra-special, savory post-ride burger and beer that we had definitely earned. And boy, did Cedars Restaurant and Lounge deliver. We added a towering plate of nachos for good measure. After setting up camp next to Detroit Lake, we slept like champions that night. It took us some 10 whirlwind hours to ride the Cascading Rivers Scenic Bikeway from north to south. Despite completing the bikeway, we were only halfway done with our journey. Now we had to pedal back. The next morning we came up with a plan to hammer out the first climb, the most difficult section of the ride north. It made sense to tackle it while the weather was still cool in the early hours of the day. Perhaps surprisingly, we both enjoyed the ride much more heading north, back towards Estacada. Not only did it have more downhill, but those drops led to bigger, better views of the mountain and river landscapes. We also saw a number of deer peeking out from the trees along the route — beautiful and unsurpassable sights. With the cool wind keeping us fresh and plenty of riverside rest stops, our momentum stayed strong. Suddenly we were again at the North Fork Reservoir, this time taking in a sunset over the water. We felt accomplished. Exhausted. But accomplished. 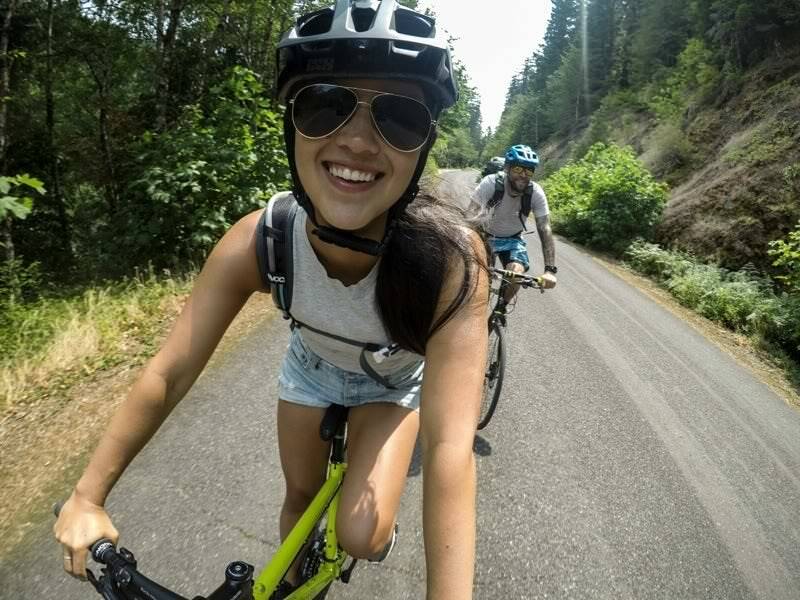 The Cascading Rivers Scenic Bikeway is truly a beautiful adventure, ideal for a venturesome couple whose idea of romance involves bike gear, or really anyone looking for an unique cycling experience. I only wish we had more time to camp and explore more — like taking a soak at Bagby Hot Springs, just 8 miles off the bikeway, or finding more waterfalls in Oregon’s Mt. Hood Territory. Next time we’ll spend three or four days to really enjoy the route and beyond. 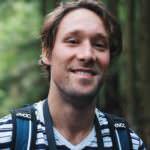 Interested in riding the Cascading Rivers Scenic Bikeway? You’re not alone. 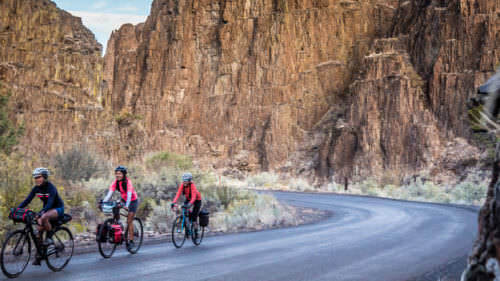 The Cascading Rivers Ride takes place September 2018. 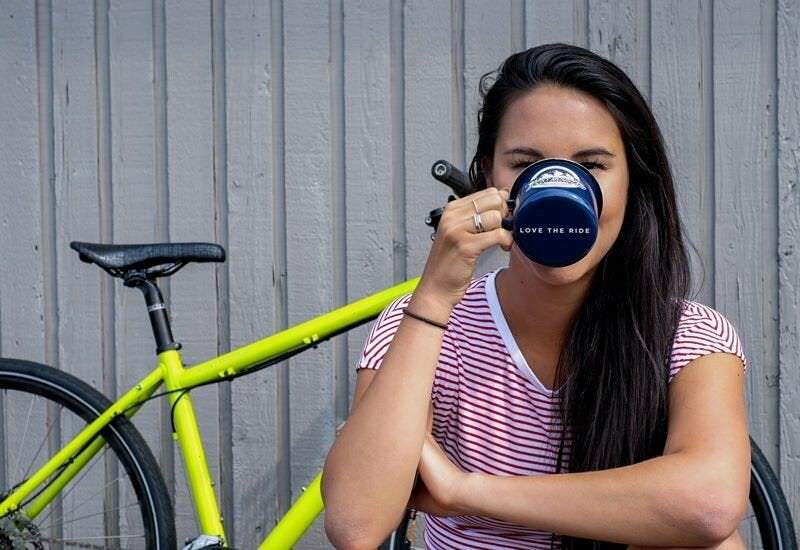 With three types of rides offered — and extra perks like meals and massages — there’s something for every cyclist at the Cascading Rivers Ride.